We have been wanting Greek food for a few weeks now and decided to go out for lunch this weekend and try a new Greek place in the area. I remembered that there was a place in downtown silver spring that could possibly cure our gyro craving: The Big Greek Cafe. We decided to go for it and give it a shot. It was a little tough to find at first, as their sign is on the small side. I was pretty sure we passed it when we saw a blue and white facade. There is another Greek restaurant about two block north on Georgia Avenue as well, but we stuck to our original plan to go to this one. The set up is such that you order at the counter and they have a good amount of seating for you to choose from. 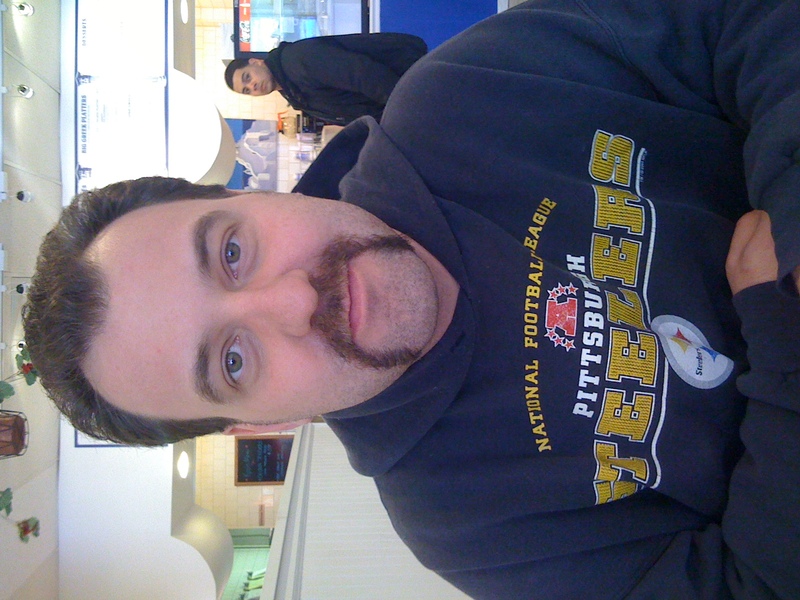 It was very clean and inviting and the guys behind the counter were really friendly and attentive. Anyway, back to the food. The menu was nice and large but we both wanted gyros. I went with the gyro salad (a “big greek salad” with gyro meat) and Greg went with the Gyro platter- which came with a gyro, salad, and choice of sides (he picked fries). Once we sat down I took a further look at the menu and found another 5 or 6 things I wanted. Guess I will have to go back! The food was as impressive as the menu. Here is my salad. It was huge! It had so many herbs and spices and it was absolutely perfect. They served it with a house “opa” dressing (which was garlicky delicious) and I also asked for tzaziki on the side, which was equally delightful and no extra charge. I saved the pita for the birds and squirrels in our backyard and ended up taking half of the salad home. I couldn’t finish this salad, despite my Saturday afternoon appetite, but it hit the spot! 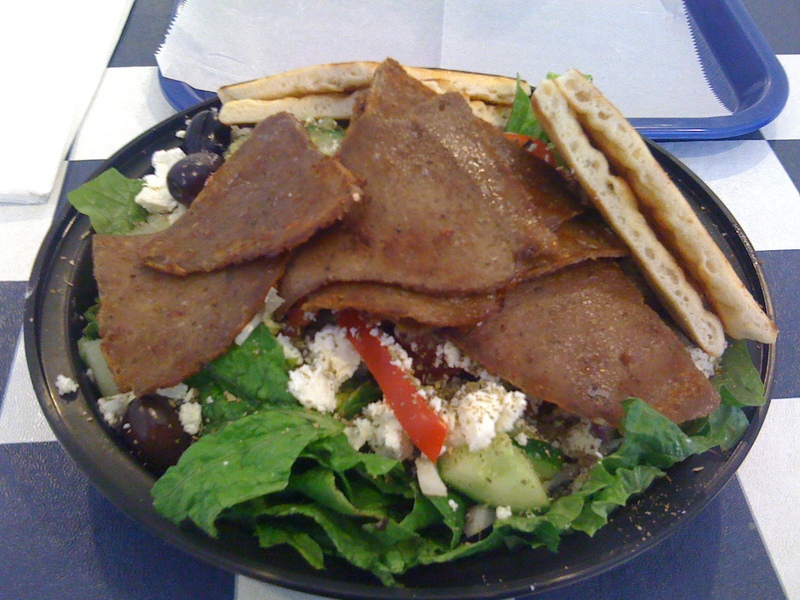 Here is the gyro platter- also a nice, big serving. The fries were soooo good! They had that beer battered crunch on the outside and they put tzaziki on top, which is genius. Our only complaint was that the gyro meat was a little dry. Believe me, we still ate it, happily, but that would be the only critique. We assumed that maybe we got meat from the end of the rotation and wasn’t as fresh as it could have been. For both of our meals and two drinks it was $22.00, which is pretty ridiculous for the quality and size of the meal. Overall we were pleasantly surprised by this place as we have sort of come to expect the worst from many local places we try. I would definitely come back here though and try some other menu items! Check it out and let me know what you think! 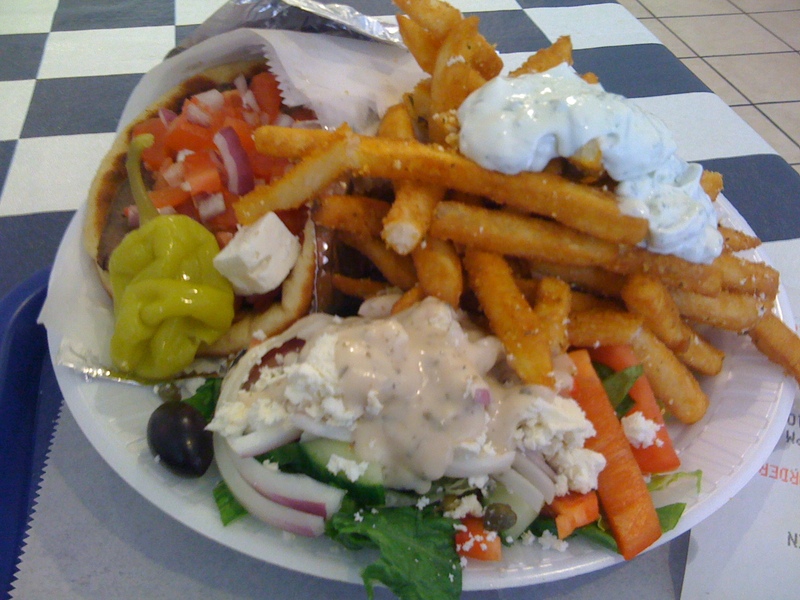 This entry was posted in Restaurant Reviews and tagged Greek, Silver Spring restaurant. Bookmark the permalink.